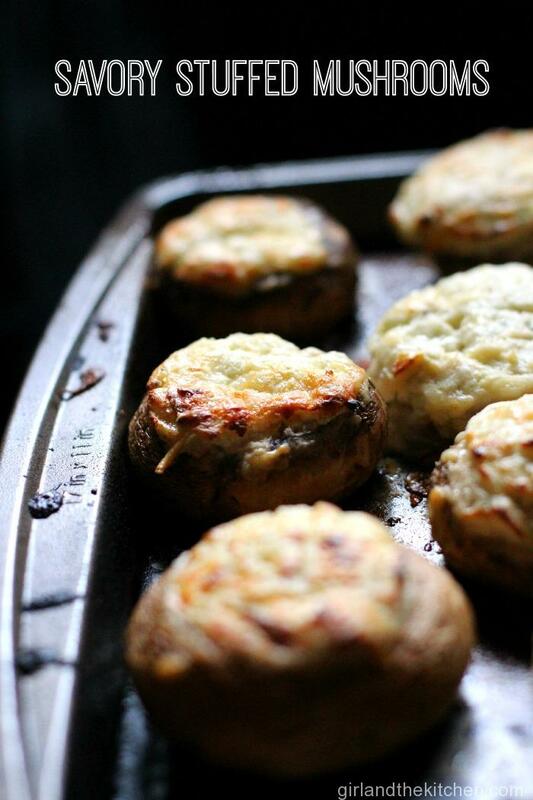 These savory and super easy stuffed mushrooms come together in minutes and are perfect little bites of creamy heaven! Make them ahead, freeze them and then just stick in the oven! The ultimate appetizer just got a bit fancier and even easier! Holidays hold a special place in my heart. Filling my house with loud laughter, savory aromas and warm hearts is what any holiday is all about. Hubs and I decided to choose a holiday to make “ours”. In which we own it every year. Invite the whole loud family cousins and all. And have a loud food and drink filled night…typical in our fashion. I do love gatherings at my house… Holiday gatherings remind me of a time long, long ago. When I was a little girl, eagerly watching my mother and babushka prep for huge holiday dinners at our house. I would watch with wide open eyes as babushka and mama rolled out huge layers for the Napoleon cake and slowly placed them on a mini baking pan from our toaster oven. Our oven broke many years ago and mama never thought we needed to get it fixed. So she used a tiny toaster oven for all her baking needs. Back then that seemed…normal. Today I look back and am still unsure how she made all that delicious food without a properly working oven. Mama was nothing short of a magician. Mama and babushka would whirl around the kitchen doing a sort of Russian culinary dance. Mama would finish garnishing a platter, babushka would quickly grab it from under her watchful hand and place it strategically on the already elegantly set dining room table. There was always a multitude of hot and cold appetizers, classic chicken pate’s, cold compound salads, red caviar with class black sour dough bread and of course beautiful platters of classic Russian cheese and charcuterie. My aunt would come over about a half hour before the party and try and fit into the careful dance babushka and mama had been dancing all day. She would sneak in and make her bruschetta on site, careful not to allow any tomatoes to go missing. Laughter would echo throughout the house, my dog would run through everyone’s legs in an attempt to catch a fallen crumb and my mom would finally gather everyone to sit down. Course after course was served by my mama and babushka. And once each course was done, they washed the dishes. Never really sitting down to enjoy the meal or the company until the gooey Napoleaon cake and steamy cups of tea were served. It was then that it seemed everyone relaxed a bit more, sometime said more than they wanted due to the previous multitude of cold vodka shots consumed. My mom was the master of quieting any unnecessary information willing to escape from my father’s mouth. One glare from mama and he knew it was time to take it down a notch. My uncle and I would turn on the boombox and dance at the end of the night. Shortly joined by my aunt and sometimes my mom. The nights always ended with us being winded from dancing and laughing so hard. And our full bellies always slept well those nights. The following morning, mama and babushka would put away all the fine china, fold the now clean tablecloth and discuss the dinner in detail. I would sit and listen to everything sometimes putting in my input and getting a little chuckle out of mama. Sadly, that never happened. As mentioned many times before, I lost my mom several years ago, before I bought my own house or before I was old enough to throw my own dinner parties. But fortunately, my babushka is still around. And she is a riot. And happens to love helping me throw parties. Hubs and I decided to call the Yom Kippur holiday our own and we invited the whole mishpucha over. My inlaws, my brother and their two kids, my cousin and their two kids, my sister in law’s parents, my aunt and uncle (complete with her bruschetta) my dad and his wife and of course babushka. I had been strategically freezer cooking for weeks following up to the holiday. Making things like my Coq au Vin, my Melt in Your Mouth Brisket, my Amazeballs and my Pommes Dauphinois and stashing them in my freezers. However, the last minute stuff…I always dislike. The little stuff is where I lack motivation. So I gave her the task of helping me with my ever so easy stuffed mushrooms. Side note… guys these come together so quickly and easily you will wonder why you have not been making stuffed mushrooms on daily basis. Plus you can make them ahead and freeze them. 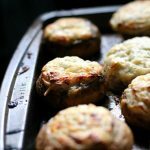 Then I came up with this idea after working at Houlihans many MANY years ago and having fallen in love with the stuffed shroom stuffing, I vowed to make them at home. They did have a secret ingredient…and it was the easiest secret ingredient ever. Ranch packets. Yes. 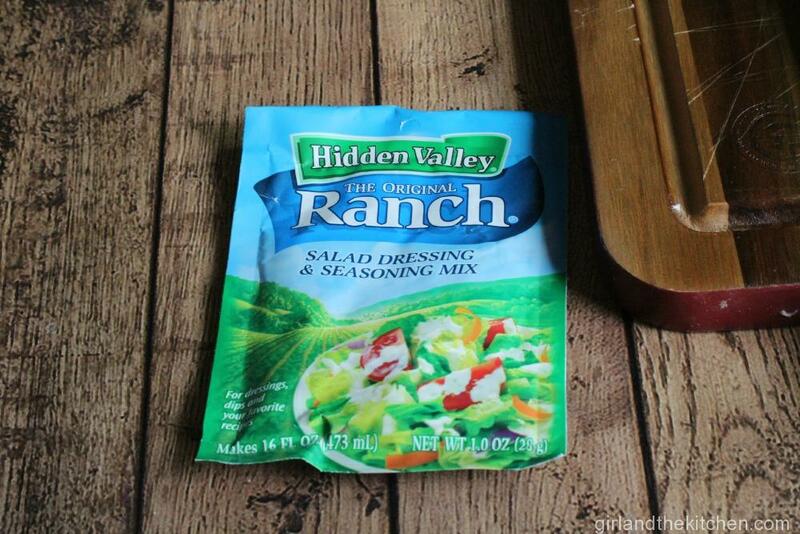 Hidden Valley Ranch packets. While she cleaned them I combined 1 pound of cream cheese, Hidden Valley Ranch packet, 1/2 a cup of good Parmesan, shredded, 3 minced garlic cloves, salt and pepper. And stuck it all in my mixer to combine. And then I gave it to babushka to fill them up. She did so very simply with a spoon. And when I started taking pictures she said, “Mila my manicure looks horrible.” Once a lady, always a lady. I then sprinkled some more Parmesan over the top of them and placed them in a 450-degree convection oven covered with foil loosely. 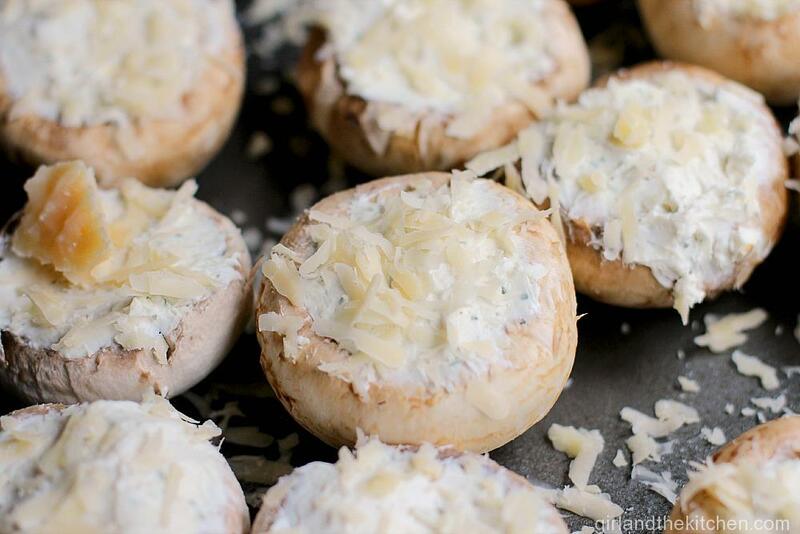 You do not want them too close to the top of the shroomies or else you will get sticky cheese syndrome. By covering them, you allow them to steam a bit, which prevents them from drying out. 15 minutes later they looked like this. I sprinkled a bit more Parmesan on the ones that suffered from the sticky cheese syndrome and placed them in the oven for another 15 minutes or until they were golden brown and bubbly. Garnish with some parsley or nothing at all and serve hot. 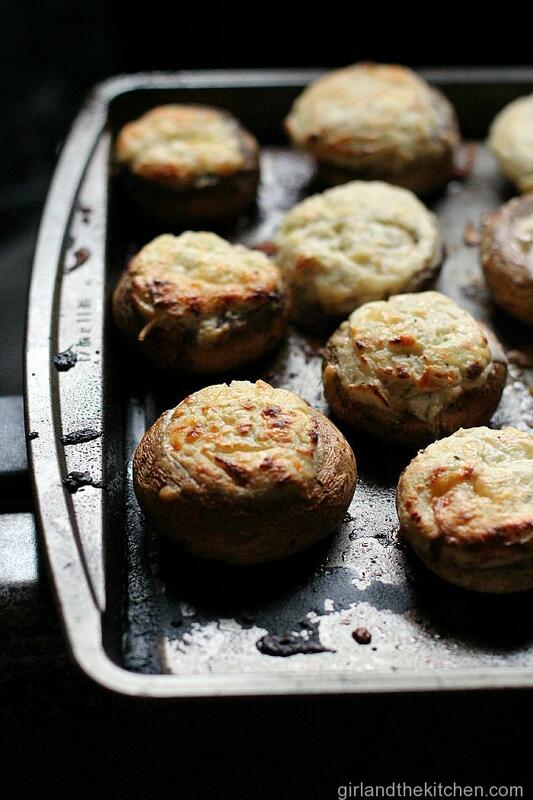 Babushka herself was impressed at how adorable and easy these stuffed mushrooms were. And promised to be my sous chef again whenever I needed her. Combine 1 pound of cream cheese, Hidden Valley Ranch packet, 1/2 a cup of good Parmesan, shredded, 3 minced garlic cloves, salt and pepper. And stuck it all in my mixer to combine. 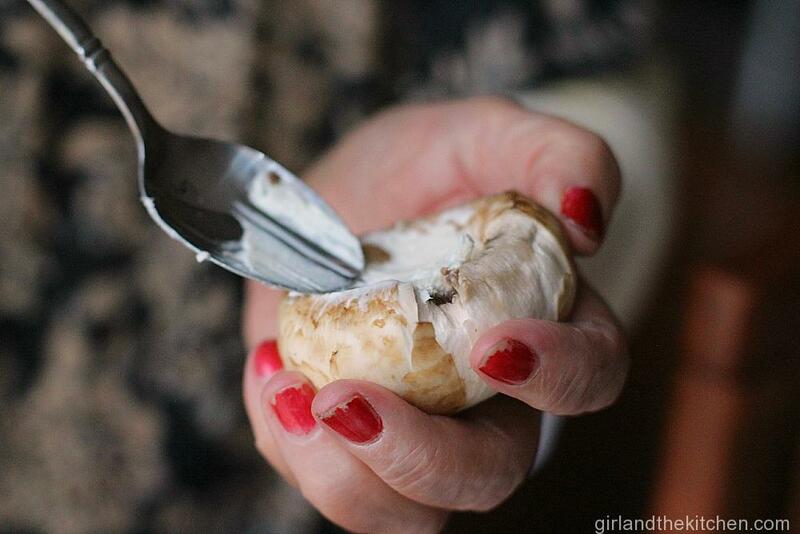 Fill up each mushroom with a spoon. 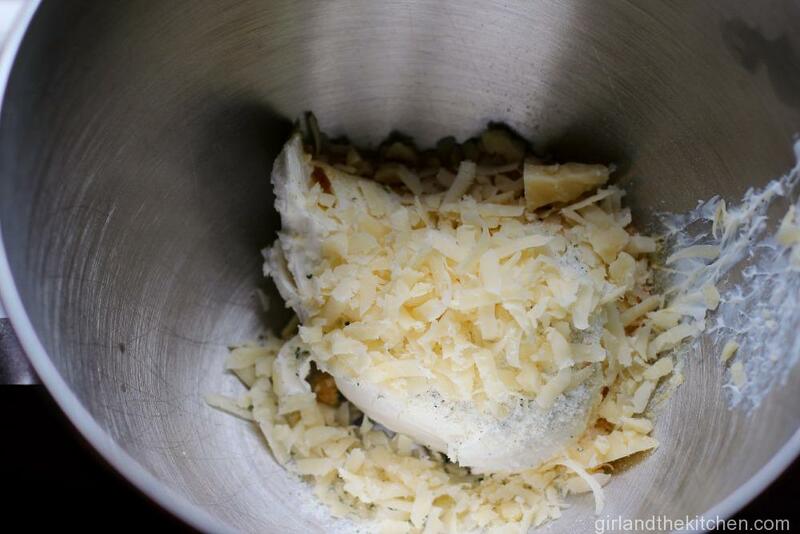 Just make sure the holes are all filled up with the cheese mixture. 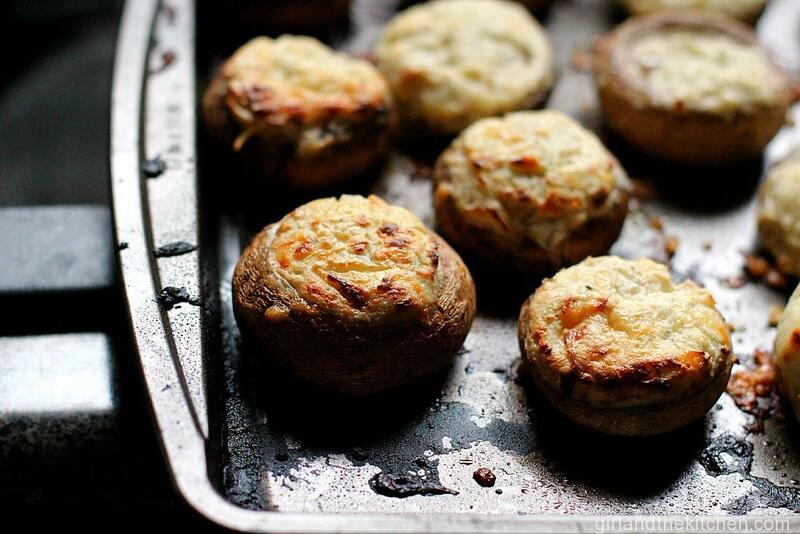 Sprinkle some more Parmesan over the top of them and place them in a 450-degree convection oven covered with foil loosely. 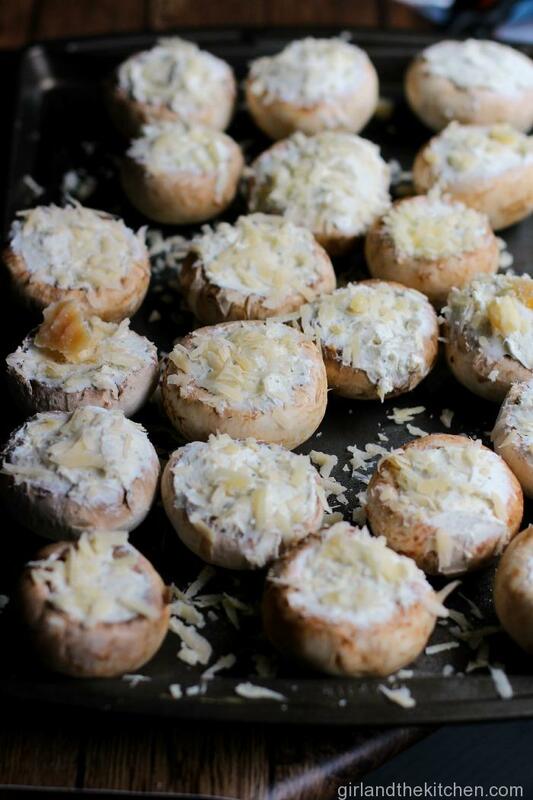 After 15 minutes, remove them from the oven, sprinkle a bit more Parmesan on the ones that suffered from the sticky cheese syndrome and placed them in the oven for another 15 minutes or until they were golden brown and bubbly. I’m going to have to make these for my son and I. We both love mushrooms!! They look wonderful! Michelle… and like I said…there is nothing to them! They come together so quickly! 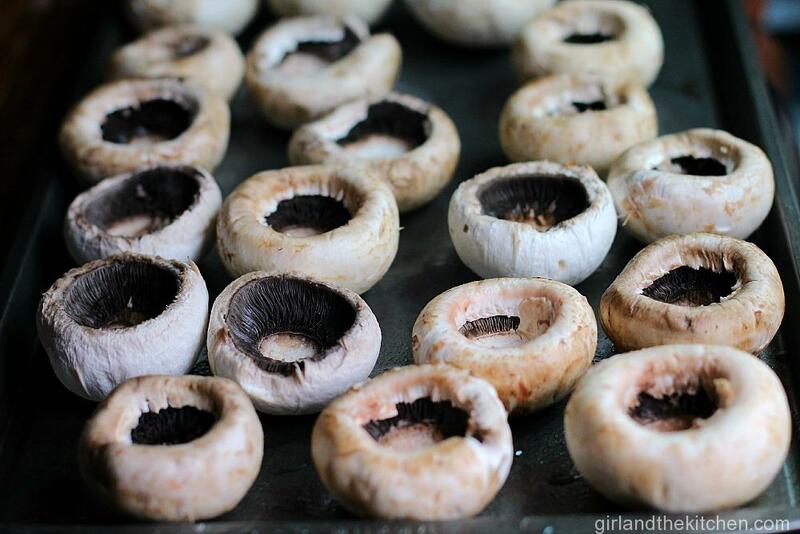 I love these mushrooms! I’m pinning this and making this (I don’t need to have a party to make this right?)!! YUM! Awww thank you!!! I love your comments 🙂 And NO you most definitely do NOT need to have a party to eat these 🙂 See ya soon sunshine! How fantastic Wendy!!! So glad you stopped by!!! And yes these will ABSOLUTELY be fabulous as a vegetarian option!!! See ya soon!!! What a wonderful story! 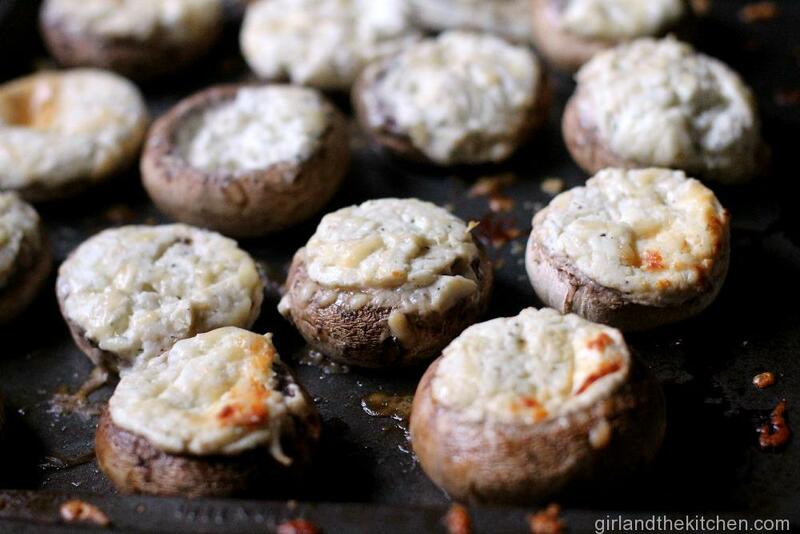 These mushrooms look fantastic, I have to try them soon! Thank you so much Amanda!!! Please let me know how they turn out! Getting ready to make these. Do you put the Hidden Valley in when you put everything else in? Yes!!! Please let me know how they turn out! Do I freeze them before or after cooking? Hey Jan! You can freeze them before cooking! I hope they turn out great!